Ahh, early Hollywood, where filmmakers were just figuring out how to do things. Where masterpieces could be spun out in any way the director saw fit. Previously I posted about how Buster Keaton would often build his stories beginning-end-middle. Now I discovered this quote from Harold Lloyd. It’s from an essay titled “The Serious Business of Being Funny”. About using scripts. 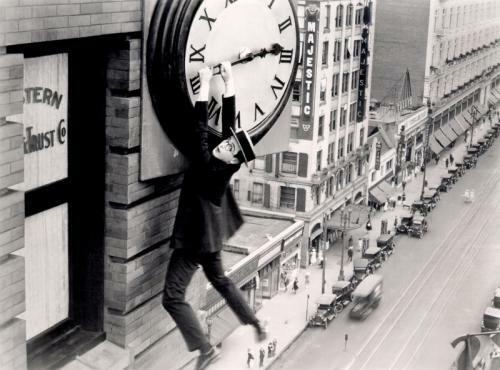 In Safety Last, probably one of our most popular films, we did the final scenes of that clock climb first. We didn’t know what we were going to have for the beginning of the film. We hadn’t made up the opening. After we found that we had, in our opinion, a very, very good thrill sequence, something that was going to be popular and bring in a few shekels, we went back and figured out what we would do for a beginning and worked on up. We tried out the same thing in The Freshman. In The Freshman we tried to shoot the football sequence first – it’s the best sequence, naturally – and we tried to do it first just as we had done the clock climb first in Safety Last. We went out to the Rose Bowl where we did a great deal of the picture, and we worked for about a week and a half, but it didn’t come off. It didn’t come off because we didn’t know the character at that time – we didn’t understand him well enough, and we were off with the wrong kind of material. So we went back and did that story from the beginning, and the football game was shot at the last. I can imagine conceiving a film this way. Having a flash of an image or sequence that is so powerful, you could build a story around it. For animation, that actually sounds quite acceptable. But to actually start shooting that scene with no idea what came before, that would be considered crazy these days. Look, all the comedians of my day had to be students of comedy. You studied comedy, it just didn’t happen, believe me. I know a lot of storyboard artists who always board the end first. They say that when you know where you’re going to end up, it’s easier to do the setup. I think that’s great advice. I’ll remember that. Thanks!